Dentures are not a new solution to oral health problems. They have been available for many years, yet are sometimes overlooked by patients who need a reliable, relatively simple solution. Sure, dentures are not going to be the right option in all cases, but they do have a time and place. In this article, we would like to highlight some of the ways in which using dentures can make a difference in your oral health future. Of course, we can’t offer any kind of diagnosis in a blog post, and we certainly can’t tell you what kind of treatment plan is going to be the best option for your situation. For that, you’ll need to see us in person at Lakeside Dental. Our friendly team would be happy to help you solve your oral health problems so you can move on with your life. Contact us today to learn more! When talking about what kind of difference dentures1 can make in your life, the first thing you need to think about is the ability to replace a missing tooth in short order. Some of the other options you may have available for tooth replacement – such as a dental implant – require more time and more invasive treatment. With dentures, you can have a quick solution, and you can have a replacement tooth in place without any surgery. For a patient who is in a hurry to have a missing tooth replaced, dentures are going to be one of the top options to consider. For instance, if you have some events coming up where you want to look your best, meaning you don’t have time to wait for an implant to setup and be completed, you may opt for a denture. Also, older patients may feel that dentures are a better choice as compared to undergoing more invasive treatment at an advanced age. Another important difference offered by dentures is the lower cost as compared to some other treatment options. 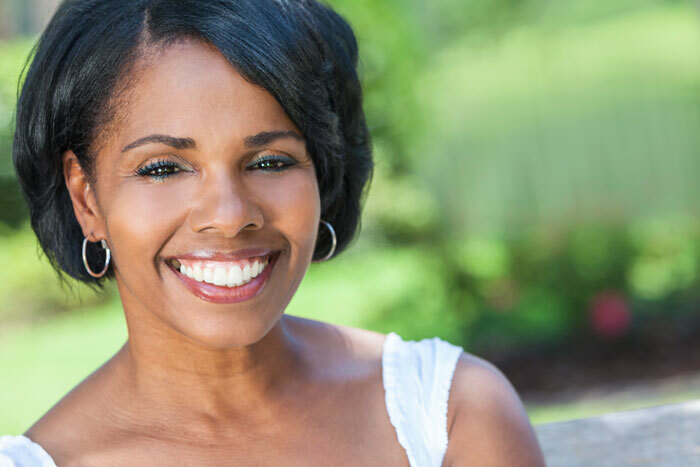 If you have been putting off taking care of your oral health needs because of the expense associated with the work, you may wish to turn to dentures as a more affordable choice. Of course, just because they are more affordable, does not mean dentures cannot offer you the help you need. By working with an experienced dental office to have your dentures created, you can look forward to reliable performance for a long period of time to come. It should be said that you don’t want to force the decision to opt for dentures just because of the potential financial savings. Sure, it’s great to save money in the short term, but ideally, you’ll settle on the best path of care for your mouth regardless of the price tag. Rather than using the cost of treatment as a determining factor, it is something that you can keep in the back of your mind as a nice bonus if you do wind up going in this direction. In some cases, a full set of dentures will be needed. When that is the case, your dentist can work with you to create a denture that is going to perform as close as possible to your original teeth. However, in other cases, only a partial denture will be needed. If you still have several healthy teeth which are functioning properly and not causing you discomfort, those teeth should stay if at all possible. That’s where the idea of a partial denture comes into the picture. A partial denture is exactly as it sounds – a denture which only replaces the teeth that are missing. This is a great option as you can have a custom solution to meet your personal needs, even if you have an unusual pattern of missing teeth. Your denture will include artificial teeth that are made to match as nicely as possible the rest of the teeth in your mouth. Also, if you have not been able to use a traditional bridge to replace missing teeth – because too many are missing – a partial denture is likely to be the perfect answer. With a removable denture, it’s possible that you’ll run into trouble at some point in terms of damage. You might accidentally drop your denture or set something on it to where damage is sustained. Or, you may find that it simply changes shape slightly over time, causing it to no longer fit as well as it did when it was new. When that happens, you can bring your denture to the dentist for a repair (in most cases – the damage may be too severe on some occasions). It is certainly best to be careful when you take your dentures out, so you don’t damage them and need a repair, it is nice to know that this is an option should something happen. Speaking of taking out your dentures, this is yet another selling point worth keeping in mind. Once you are fitted for your dentures and they are created just for you, you will be able to wear them throughout the day, day in and day out. However, at night, or when you would just like a break, you can simply take them out and set them in a safe place. It’s nice to have this option, even if you find that your dentures are rather comfortable – which they should be, as long as they have been designed properly. The ability to quickly pop them in and out as you see fit is yet another in a long line of benefits to be enjoyed by those who choose dentures. Thank you for visiting the Lakeside Dental blog. As a trustworthy dental office in Moses Lake, WA2, you can be sure that we will always have your best interests in mind. Whether the right choice for your treatment turns out to be dentures or some other option, we’ll work hard to achieve the outcome you desire. Thanks again for stopping by, and we look forward to seeing you soon!